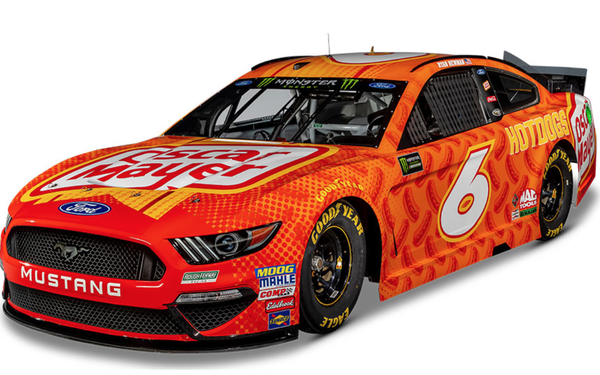 Oscar Mayer has signed on for a sponsorship deal with Roush Fenway Racing and NASCAR driver Ryan Newman. The first stop is the iconic Daytona 500, where Newman will power the No. 6 Oscar Mayer Ford Mustang on Feb. 17. The brand created a 47-second video to unveil the sponsorship. “We have big plans to support the sport and the No. 6 Oscar Mayer Ford Mustang this year,” says Matt Riezman, associate director for Oscar Mayer, in a release. Oscar Mayer will return with the No. 6 Ford at Phoenix on March 10 and will be featured as the primary sponsor on a number of races throughout the year. Other races include Charlotte (May 26), Chicago (June 30), Loudon (July 21) and Darlington (Sept. 1). The Ford Mustang will sport a different design scheme at each race. Other primary sponsors this year include Ally Financial, who took the place of Lowe’s as primary sponsor of NASCAR legend Jimmie Johnson and the No. 48 Chevrolet, and Auto-Owners Insurance, which signed a multi-year agreement Jan. 8 to serve as a primary sponsor of Martin Truex Jr.’s No. 19 Toyota Camry. A limited-race sponsorship (in lieu of the entire season) is less expensive for brands and becoming more common, says Jeremy Lang, vice president and general manager at Leavine Family Racing. "The sponsorship landscape for NASCAR race teams has changed over the last few years," Lang writes in a blog on the LVR website. "Gone are the days of full, season-long sponsorships valued in the eight-figure range. Teams have become much more flexible in working with potential partners to shape a deal that works for both parties and doesn’t necessarily require a massive investment to get started."